Welcome to the ConferenceXP Home Page! Includes a Windows application for conferencing and collaboration that is simple to install and use, and works with most commodity audio/video hardware. The codebase uses .Net technology. It is clear and well organized, and easy to build and extend. Licensed under Apache License version 2.0 which permits a wide range of uses. Source code is available on GitHub. Details here. We encourage you to use the GitHub issues feature for questions, bug reports and discussion. Venue service: Maintains a mapping of venue name to multicast address, and provides a web service which allows clients to discover available venues. Archive service: Backed by SQL Server, the archive service allows a conference to be recorded and played back. Reflector service: In cases where multicast isn't available, the reflector service can bridge clients together using unicast. Diagnostic service: Maintains current send/receive statistics to allow clients to discover in real-time where networking or other problems exist. 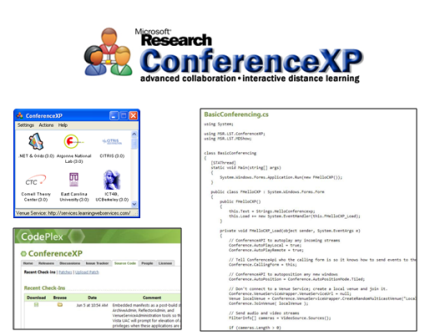 ConferenceXP originated in 2001 at Microsoft Research where most of the core development was done. In 2007 Microsoft Research External Research and Programs funded the Center for Collaborative Technologies at the University of Washington to continue work on the ConferenceXP platform and to apply the technologies to a wide range of educational and collaborative scenarios. In 2010, rights were transferred to the OuterCurve Foundation and the Apache Licence version 2.0 was applied.